A Cherkess, one of tribes in Northern Caucasus, Sultan Kelech Girei born in 1880 in Uyala (another source said in Maikop). After graduated from Grodno military academy, he served as an officer in Czar Army. 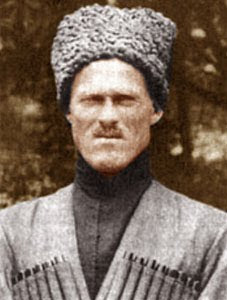 Participant at the suppression of 1905 revolution, during the First World War, he led a Cherkess cavalry regiment in the Russian Imperial Army. After the Russian Revolution, he served with the White army under General Wrangel and tried to stop the Red Army movement into North Caucasus. Defeated, he escape to Georgia, and then emigrated to France. During World War II, he live in Berlin and participated in some Caucasian freedom committees, including Central Committee of the People's Party Montagnards. He also helped the Nazis to establish some Caucasus volunteer units to combat the Soviet partisans and the Red Army. In 1943, he formed a division of Mountain Peoples of the Caucasus, which mainly served as anti-partisan unit in Yugoslavia and Northern Italy. The SS have a plan to make his men as a reserve for Kaukasiches Waffen Verbänd der SS. At the end of the war, he and his men surrendered to the British Army in North Italy. However, with thousands of Cossacks and mountaineers volunteers in Hitler forces, Girei was handed over to the Red Army in Judenburg on May 29, 1945. He and some other ex-leaders of Cossacks and mountaineers formations were sentence to death by Military Division of the Supreme Court USSR. He was executed by hanging in Moscow on January 16, 1947.